You’re walking the streets of New York, headphones cranking your favorite jam. You look up and see a poster for the exact band you’re rocking. On your left, the song lyric you are hearing is–like magic–written in graffiti… chills abound! These moments reveal the magic of Synchronicity, a feeling that asks us if there is more to this world than what we can see. Meanwhile, a particle accelerator–or Supercollider–increases the energy beam of particles by generating electric fields. The particles then accelerate and magnetic fields steer and focus them. 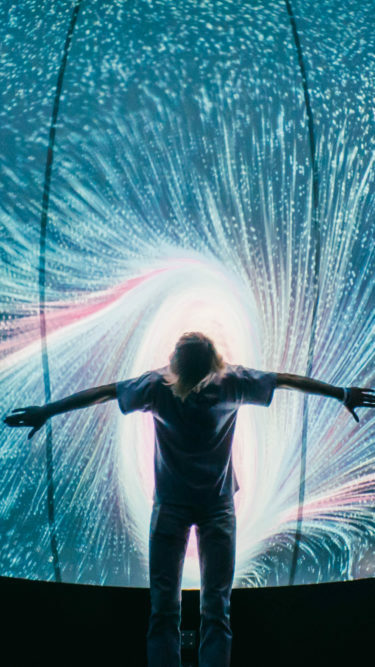 The scientific goal is to recreate the Big Bang: to study the origins of the universe and prove through rigorous data that we are truly all connected. Is it possible to design an environment that blends intention, story, art, HP technology, and human energy to foster synchronicity to occur? Can we create a Synchronicity Supercollider? We kindly welcome you to the 2017 LAB at Panorama, Powered by HP. 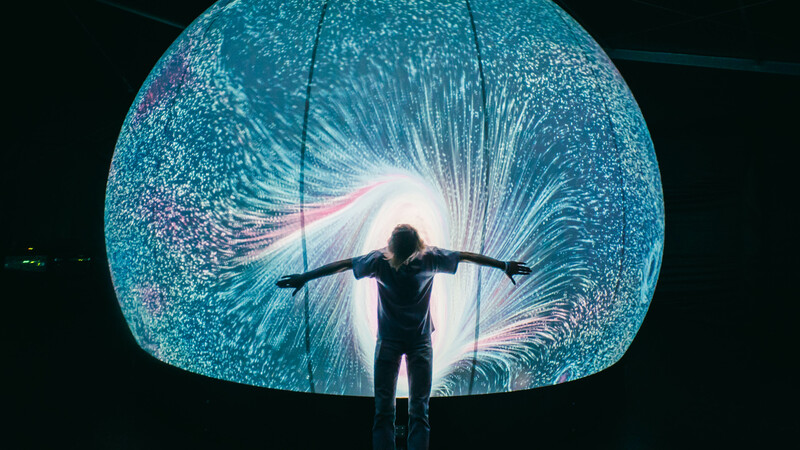 At the heart of THE LAB are The Exhibitions, a showcase of New York City’s local talent and innovation with a series of dynamic and immersive art installations driven by technology. Artists designing installations include Prism, SOFTlab, Future Wife, Ekene Ijeoma, Emilie Baltz, and The Windmill Factory. Future Portrait transformed motion into an amazing dynamic film. Attendants drove uniquely beautiful particle animation that was remixed and shared on the fly. An interactive cube of responsive mirrors that redirected light and sound as a volume that reflected the excitement of surrounding festival goers. Volume used mirrors, light, and sound as fundamental building elements to remix the character of the festival goers and gaze back at them with empathy and exuberance. Heartfelt was a participatory interactive installation which engaged participants in holding hands and letting electricity flow through them to turn on lights and play sounds. It used participants’ bodies as conductors to close the circuit of socio-political polarization, creating a shared experience of solitary and interconnectivity. Right Passage was a room scale sound and light performance installation. Participants began in a massive hazed void. A reflective labyrinth emerged, guiding attendants towards warmth. A rite of passage, a journey from darkness to light, a disorientation of the senses. Visually produced by Dirt Empire with original music, sound design, and spherical audio spatialization by Danny Bensi and Saunder Jurriaans, the 90-foot dome allowed more than 250 festivalgoers at a time to experience the 360 degree immersive theater and provided its viewers with an unparalleled collective sensory experience. Proclaimed by the Observer as “the selling point of THE LAB,” The Dome is where Panorama’s synthesis of art, technology, music and design is given its ultimate expression.